This book was a pleasant surprise! I really enjoyed the characters and the suspenseful story line. The love story is sweet but the story does focus on the current homicide that the two detectives are dealing with. Tess lost her friend on the night of high school prom and ever since she has been trying to find the killer. When another victim shows up with the same signs Tess and her new partner uncover the past. I love how the author incorporated the quilt in with this book (I can't giveaway details) but it was a very creative idea. While full of suspense, it's slightly predictable (at least it was for me) but the quilt added a twist. For a short suspense with a touch of romance this makes for a good read! "I received this book from Litfuse free in exchange for an honest review." 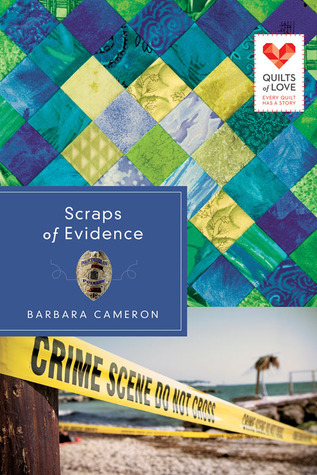 Barbara Cameron's Scraps of Evidence is the newest book in the Quilts of Love line, and Barbara is celebrating with an "intriguing" Kindle HDX giveaway! Enter today by clicking one of the icons below. But hurry, the giveaway ends on March 8th. Winner will be announced on the Quilts of Love blog on March 10th.